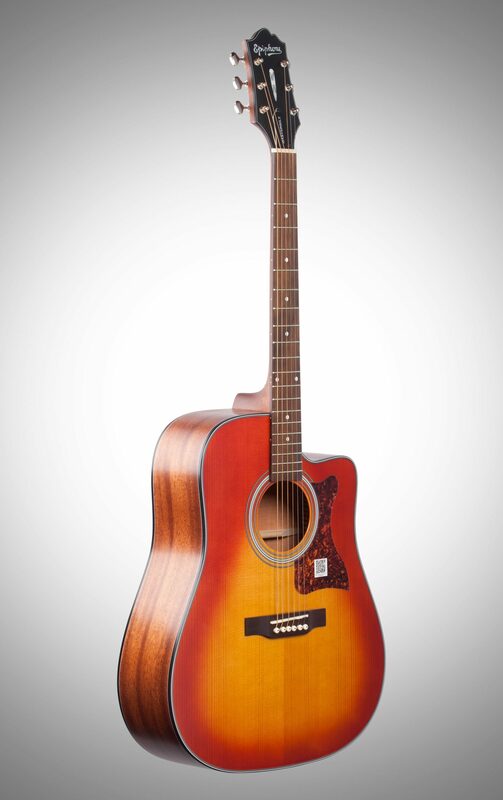 The Epiphone Masterbilt DR-400MCE Acoustic/Electric Guitar is Epiphone's most affordable solid body acoustic guitar ever made with the legendary build quality that Masterbilts are world famous for. Featuring a Solid Sitka Spruce Top, cutaway for easy access, Mahogany body and neck, bone nut, and the superb eSonic HD preamp system and NanoFlex-HD pickup for true acoustic sound when plugged in. Available in Natural Satin and Faded Cherry Sunburst. 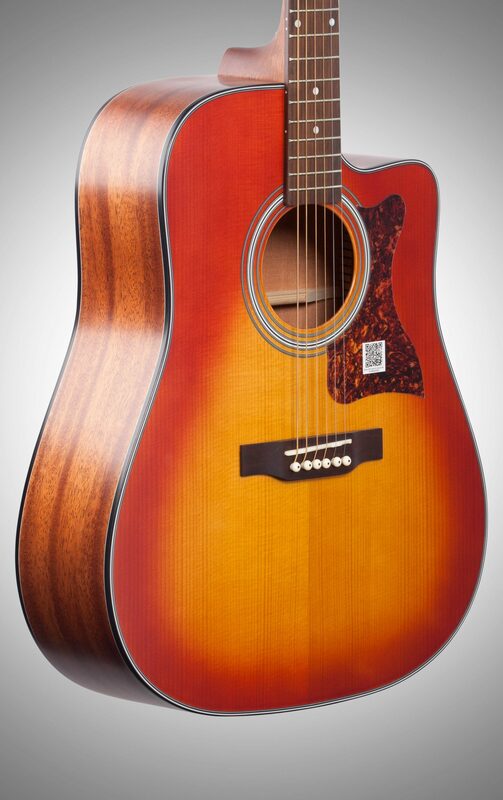 Like all Masterbilts, the DR-400MCE features a solid wood top made from Solid Sitka Spruce and available in Natural Satin or Faded Cherry Sunburst Satin finishes. 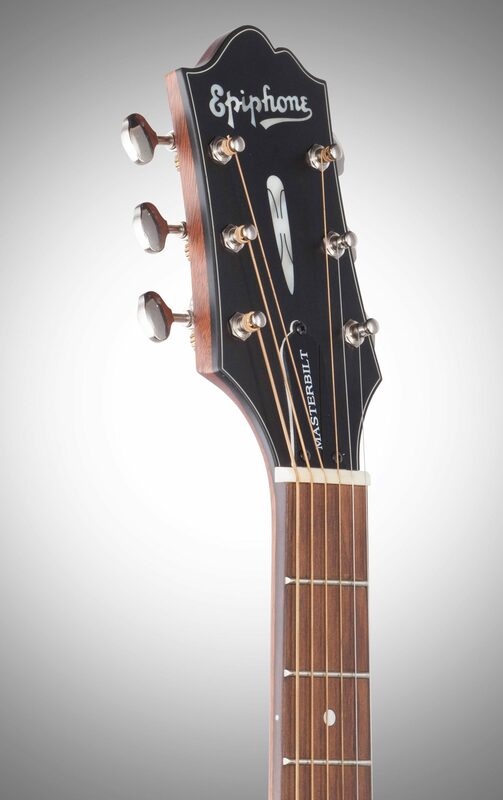 The DR-400MCE has a smooth cutaway for easy upper fret access and both the body and headstock black and white binding. The body and neck are made from solid Mahogany and have a natural satin finish. 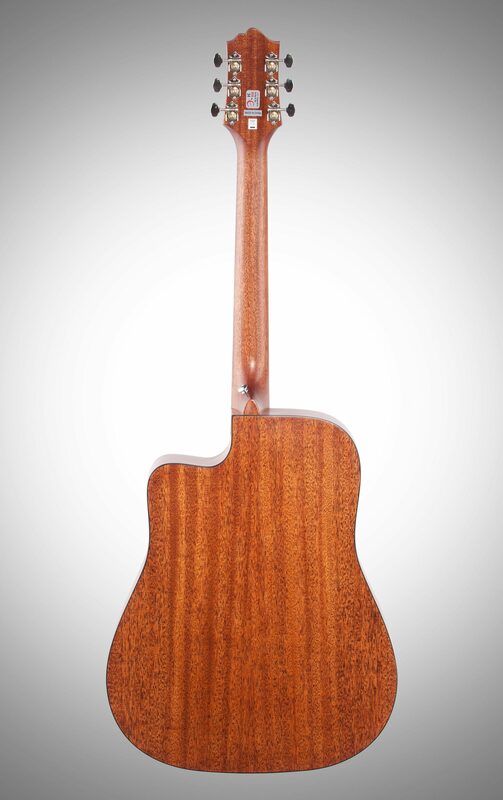 The Mahogany neck has an easy-to-play 1960's SlimTaper profile and is glued to the body with a Dovetail joint. The Torrefied Composite "Blackwood* fingerboard has a 25.5"" scale length, bone nut, 20 medium jumbo frets, and a 14* radius along with elegant pearloid "dot"" inlays. 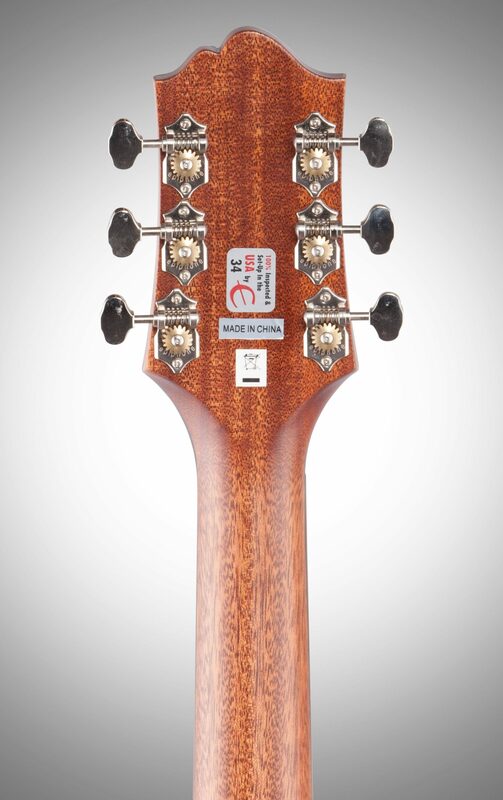 The headstock has the classic Masterbilt asymmetrical profile with a pearloid 30s era Masterbilt logo and vintage "Stickpin" inlay. The cover for the two-way adjustable truss rod has "Masterbilt"" in white. The body has an imitation tortoise pickguard, a Torrefied Composite "Blackwood* bridge, and a compensated bone saddle. The Masterbilt DR-400MCE is powered by the superb eSonic HD preamp system and NanoFlex-HD pickup located under the saddle. The eSonic preamp system is recognized as one of the best in the world for amplifying the true acoustic tone of your guitar on any stage without the harshness most acoustic guitar pickups are known for. Designed by Shadow Germany, the eSonic HD preamp's sensitive controls are mounted in the soundhole for fast access and include Master Volume and Master EQ with center detent. The NanoFlex-HD pick up is powered by a long lasting 9-volt battery. The battery compartment is located next to the nickel 1/4 output jack for easy changing. All of Epiphone's Masterbilt acoustic guitars come with solid and reliable hardware. The DR-400MCE include Epiphone Vintage Premium Open-Back machine heads with a pro 18:1 tuning ratio plus a nickel 1/4 output jack and nickel strap buttons. The DR-400MCE is set up at the factory with Cleartone 12-53 acoustic guitar strings. An Epiphone hard case is also available. Overall: I've been playing guitar for over 40 years and I have owned more guitars than I can remember. From American made Martins and Ovations to vintage Epiphones, Older Yamahas and Alverezes. For the money this is the best guitar I have ever owned.The actions is nice and low making it a dream to play, The intonation is spot on, the lows are smooth as butter, the highs aren't too bright and a perfect midrange to boot. It is so well balanced. 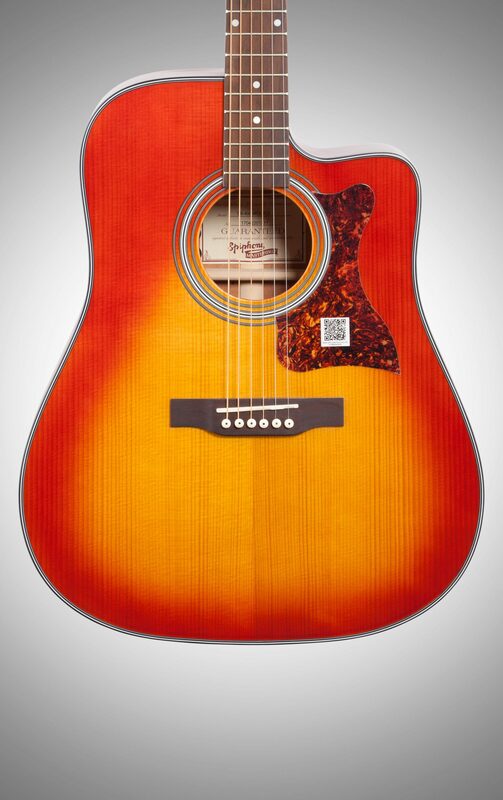 This guitar easily out performs guitars 2 or 3 times the price. Without any exaggeration I am absolutely elated with this product. I can't thank my wife enough for buying this for me.! Style of Music: Classic Rock, 70's singer songwriter, Southern Rock. 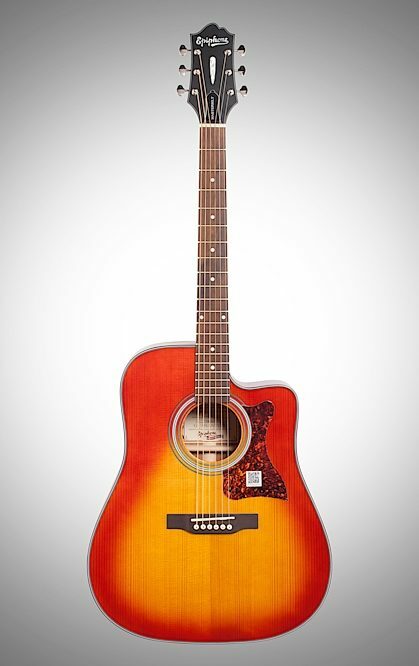 Overall: The Epiphone DR-400 is the BEST DEAL.. I prefer OOO or OM, but at $400, this guitar is awesome. ALL SOLUD WOODS and an olderE-Sonic pre. The DR500 has a dual system, nicer top.... but it fails and NO ONE FIXES IT, they replace it with cheap clones... THROW AWAY, or buy A NEW and have it installed. This is cheaper, sound awesome. After setup, it stays in tune. 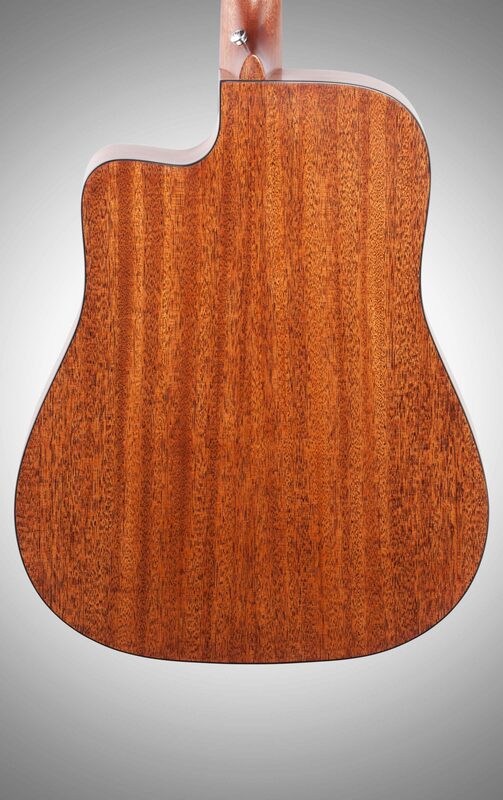 Too bad they use CEDAR for top on Rosewood model, which is concert size. Or I would own it too, instead of Ibanez AE500.